One of the benefits of living in the countryside is the opportunity to see a lot of wildlife. We see baby deer, owls, and even bears strolling (or flying through our yard). It’s one of the things I treasure most about our rural life and am so grateful that our children will have a better understanding of the natural world. It isn’t always sunshine and roses though. 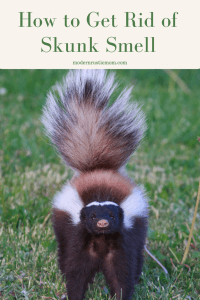 We found that out the other night and learned how to get rid of skunk smell too. 1. Spray and dab with Simple Green. 2. Use 2-1 water to apple cider vinegar mix. 3. Soap and water to rinse off everything else. It was late evening and my husband and I were almost ready to head to sleep. He let the dog out one last time for the night. We were enjoying the fresh cool air coming through the windows. It’d been weeks since we were able to open the windows due to muggy weather. All of a sudden, hubby turned to me to ask if I “smelled something”. Sure enough, the smell of skunk wafted in through the windows. We looked at each other in disgust then a big “uh-oh” as we realized the dog was outside still. Of course our dog found the skunk! And, even better, it was late on a work night! We obviously couldn’t let her in the house with her skunk cloud. So we set about figuring out how to clean her. We had no tomato juice to speak of and a quick Google search for “getting rid of skunk smell” quickly let us know that it wouldn’t help us anyways. We, fortunately, figured out a way to get rid of the skunk smell in one night. By the way, we did this outside in the lawn, knowing she was going to shake everything all over the place. We also have a long lead rope that clips to her collar that would help us keep her in one place. She doesn’t like baths so outside made it much easier to handle a wet and stinky dog! We did a three step process but I think that step one was the most effective. I am not seeking out another opportunity to confirm this however. Firstly, the skunk most likely sprayed your dog or cat in the face since that was probably how they found the skunk. So their face and ears will need the most cleaning and the most gentle approach too. Be careful not to pour any of this down their face and be sure to dab the fluids around their eyes. If you haven’t heard of this product yet, you should check it out. I’ve liked it for many years I often use it to clean our countertops. And it really came through for us this time. You can pick Simple Green up at your local hardware store or on Amazon. It comes in all sorts of versions but we just use the all-purpose cleaner. It works because it’s designed to cut through oil and grease. 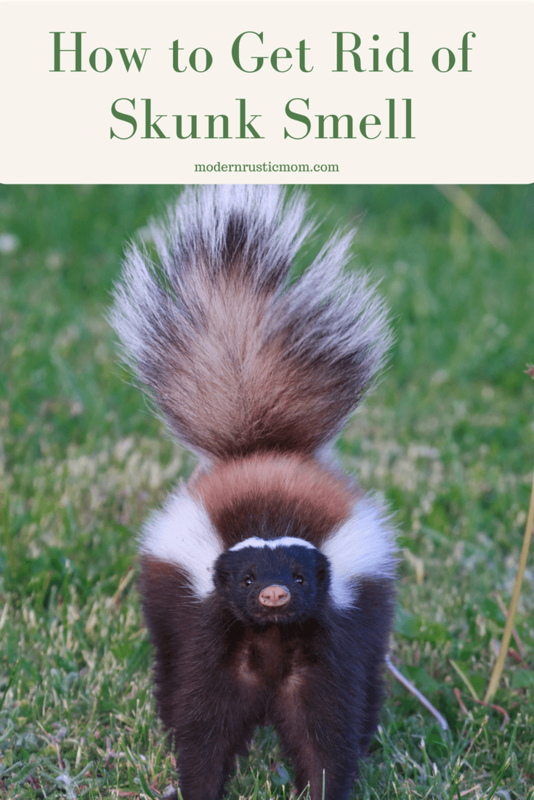 Skunk spray is oil-based and needs the extra cleaning power. Spray your dog’s body with the simple green spray and then carefully dab it around your dogs face enough the fur is wet. You want to be very careful not to get anything in your dogs eyes. Then wipe her down with paper towels to remove the skunk oil and the Simple Green until almost dry. You’re trying to wipe the spray and the oil off together. Like I mentioned before, I think this step worked the best but we also did Steps 2 & 3 so if you still are having trouble or the spray is really bad, try the next steps. So mix up a big pitcher of water to apple cider vinegar. I did 2 cups of water to 1 cup of vinegar. Then we repeated the process from Step 1 with wetting her body then dabbing the mixture on her face. Make sure your rag isn’t dripping when you dab her face. We did a quick rinse to get most of the vinegar mixture off then soaped her up with our septic and lawn friendly soap. We scrubbed her with an old horse brush to get everything off and we were done! After the last step, there was still a very faint skunk smell in her fur. I think this was mostly because she was sopping wet but it was minimal. There was no way we could leave her out to dry off so we rubbed her well with our worn out dog towels before letting her back in the house. We covered the couch cushions and her bed in more towels just in case and hoped it would do the trick. Next morning, she woke us up with sweet slobbery kisses without a hint of skunk! Nature is pretty amazing but quite often reminds us that we are at her mercy. 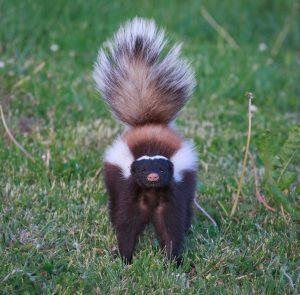 Has your dog ever been sprayed by a skunk? Or have you been sprayed? Let me know how it happened in the comments below! We have had lots of skunk/dog encounters and this mixture has never let us down!! Make enough of a paste for your size dog (we have huge dogs) stir together and use as a shampoo-works every time!! This is also a great cleaning agent for bathtubs and showers and other household cleaning chores-add a little lemon essential oils for fragrance! Thanks for the tip! We didn’t have any Blue Dawn on hand that night but the lemon oil, baking soda, and soap mix sounds really nice! Thank you for sharing!